When do you buy a call option? You may decide to buy a call option if you have the view that the market will rise. You pay a premium to the seller of the option in order to be able to purchase the stock at the strike price of your option rather than the market price – which you think will be higher. If you are right and the share price rises above the strike price of the option before it expires, you might exercise your option and buy the underlying stock at the strike price, or if you didn’t really want to own the stock you would sell your option back to the market for a profit. If you were wrong and the share price dropped below the strike price it would be pointless to exercise your option (you wouldn’t buy shares at a higher price than the market price!). The option would lose in value, but you could still sell it back to the market before its expiry and recover some of your initial outlay. If you let the option expire and do nothing, you have lost the entire premium that you paid for the option. When do you sell a call option? You may decide to sell a call option if you have the view that the market will remain steady or fall. You generate your income at the point where you sell the call (you receive the premium paid by the buyer), and you want the stock price to remain below the strike price until the option is expired. That way you get to keep the premium (your profit). If you are right and the stock price remains below the strike price, the buyer of the option will not want to exercise it, and if no one exercises the option before it expires, you as the seller get to keep the full premium initially paid by the buyer. If you were wrong and the stock trades above the strike price, the buyer would be able to exercise his option at expiry and you would have to deliver the stock. You would be obliged to sell the stock at the strike price. If you didn’t actually own the stock you would be obliged to buy the stock on the market (possibly at a much higher price than the strike price) before selling it. Alternatively you could act before the expiry date and buy the option back for its – now much higher – market price. That would mean a serious loss! Writing call options without further protective measures is also called writing them “naked”. You should never write naked options! Options can be combined to exploit every possible market setup. For example if you sold a call over a certain stock with a certain strike price, and also bought a call over the same stock with a different strike price (but the same expiration) this would be called a “spread trade”. 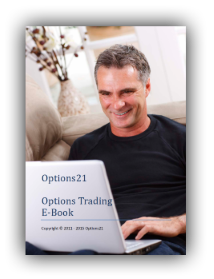 Options are generally combined to form options trading strategies in order to limit your possible losses. Note: If the above information left you with questions or you would like to learn more about related topics, please make sure you order our Free Options Trading CD which we compiled with a wealth of information about options trading for all levels of traders, including recordings, examples, charts and lots more!